Cohen & Rogers 41. Edition 100. Signed in pencil. Image size 10 1/2 x 14 1/16 inches (267 x 358 mm); sheet size 13 1/16 x 17 7/16 inches (332 x 443 mm). A superb impression, with rich blacks and a wide range of grays; full margins (1 1/16 to 1 1/2 inches), on cream wove paper, in excellent condition. Published by the Associated American Artists, New York. 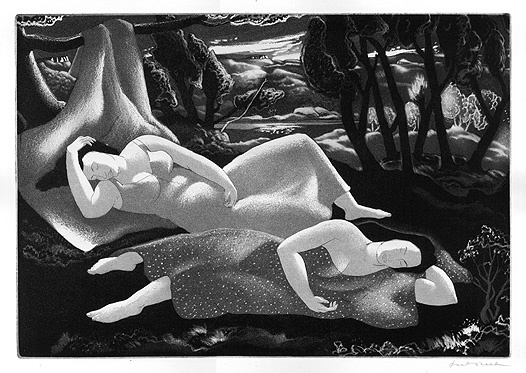 Exhibited in American Graphic Art of the 1930s, Fitchburg Art Museum, 1976. Figure with Landscape ---1953, Aquatint. Cohen & Rogers 80. Edition 100. Signed in pencil. Signed and dated in the plate, lower left. Image size 10 1/16 x 15 1/16 inches (256 x 383 mm); sheet size 12 11/16 x 17 1/16 inches (322 x 433 mm). A superb, velvety impression, with rich blacks and a wide range of grays; full margins (1 to 1 3/8 inches), on cream wove paper, in excellent condition. Made specially for The Society of the Print Connoisseurs of America and published by Associated American Artists, New York. Collections: Victoria and Albert Museum; LC; NGA; NYPL; Kansas State University; Hofstra Museum. 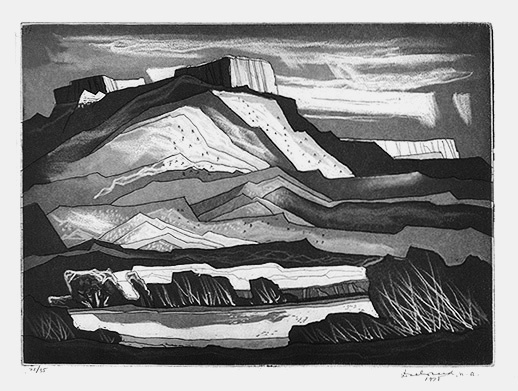 The Gorge at Pilar ---1978, Aquatint. Cohen & Rogers 132. Edition 35. Signed, dated, and numbered 21/35 in pencil. Image size 10 7/8 x 15 inches (276 x 381 mm); sheet size 14 7/8 x 22 1/4 inches (378 x 565 mm). A superb, velvety impression, on off-white wove paper, with full margins (1 3/4 to 3 3/4 inches), in excellent condition. Special Plate for the Society of American Graphic Artists, New York, 1978.